Keeping things pretty simple today. Kidlet was being silly the other night and making a turtle with hands and then asked for a turtle lunch! I was happy to oblige especially since I happen to have a turtle cookie cutter! AND I found this hilarious Lunchbox Love note to go along with it! 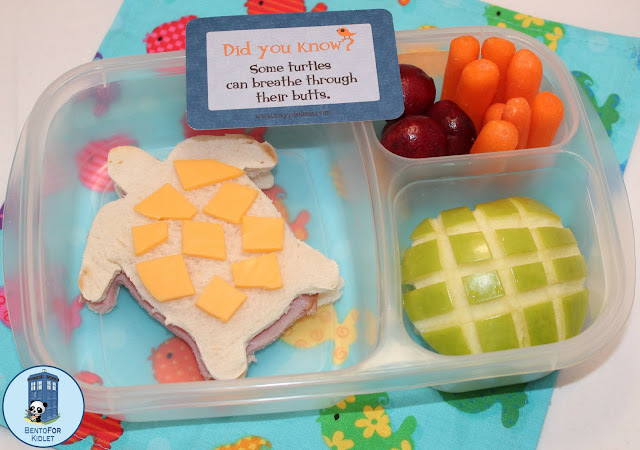 Awwww, cute turtle lunch, even ur apple matches, how cool! Fun lunch! I love your cheese shell! I love that note :) Your turtle shell is clever! Your apple carving always amazes me - cute lunch!